As a small business owner, you’re going to be on the move. You’re likely helping with outside sales, traveling to trade shows to network, or visiting your other locations. So how do you keep on top of what’s going on with inventory management in your warehouse? Nearly half of small businesses use slow, ineffective manual inventory tracking methods like spreadsheets or handwritten records, or don’t track inventory at all, according to the 2016 State of Small Business Report. If you are one of them, then you probably don’t really know the status of your inventory. These processes aren’t accurate, let alone in real-time, which won’t answer any important questions you might have while you’re away. Even if you’re in town, you might just have a nagging question that’s keeping your up in the middle of the night. Then what? Nearly half of small businesses use slow, ineffective manual inventory tracking methods. 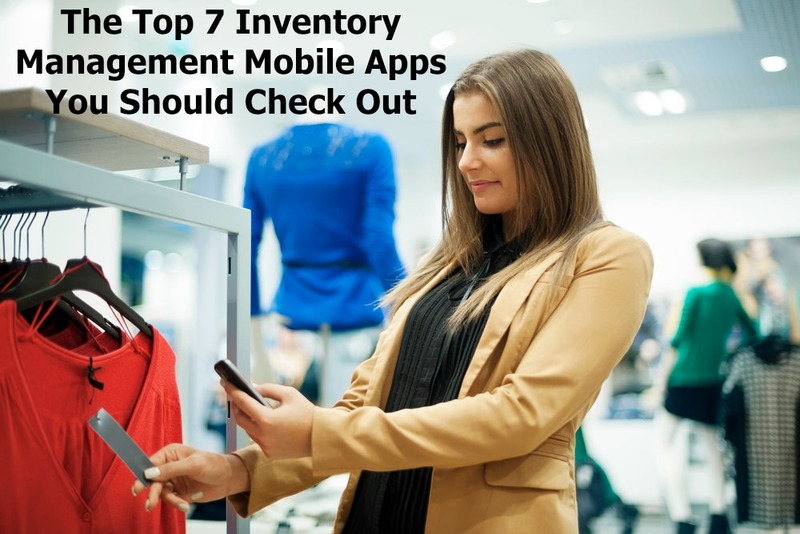 Have you tried any inventory management apps? They’re as easy as downloading your favorite game, but will be just a tad more productive! As with any technology these days, there are a lot of apps to choose from. And of course some are for Android or Apple® or sometimes both types of devices. So be sure you check the compatibility of each. To help you choose the best one for your business, I have compiled a list of the most recommended apps, from lowest to highest cost, along with a brief explanation of each. The Stock Control app features built-in search tools, stock organization, a refined sorting system for stock as well as shortage alerts. It’s compatible with iPhone, iPad, and Mac and is available for free, with other in-app purchases available. If you’re looking for a basic inventory management app that will simply allow you to take a look at your inventory situation while you’re away, then try GoodsOrder Inventory. This particular app can synch your inventory, manage orders, and track sales, in real time, on your mobile device. It supports barcode scanning with smartphones or tablets and boasts user-friendly interface and easy navigation. A downside could be that it doesn’t integrate with other systems or software. However, in a pinch you can still export a spreadsheet from the app to review your data. This smartphone app is available for iPhone, Android and BlackBerry devices, and is currently available for free. There is a pro version with more features on the horizon. This is another basic inventory management app that can track product levels, orders, sales as well as deliveries. A few of Business Inventory‘s top features include photo product listings that can be taken with your phone camera, barcode support, and the ability to export data to an email or spreadsheet. Right now, this app is only available for iOS. The price is inexpensive; it’s just 99 cents. The Inventory Tracker app is one you should take a look at. Please note that it is designed only for the iPad. This comprehensive inventory app synchronizes your inventory and comes complete with high-function features you might think would only come on a desktop application. And you can’t beat the price, a lite version of the app is free to try it out, and you can purchase the pro version for only $3.99. This inventory management app is perfect for small businesses, with the ability for iPad users to easily sync data between the mobile device and the built-in barcode reader. Key features include analyses and sales reports, product-by-product sales and order history, barcode reader, color-coded system for current inventory, and more. The cost is just $4.99 on iTunes. We’re not talking veggies here, but Lettuce can be good for the health of your company. It’s more than just an inventory app, according to Entrepreneur blogger Amy Gahran, In her review, she reported that it integrates other systems, such as payment processing, order capture, shipping, tracking, and customer relationship management to name a few. The app also makes mobility seamless with its cloud-based web app. You can easily switch between your iPad and computer — from user setup to accessing records. The cost is more of an investment, yet still relatively affordable for such a robust app: $59 per month, with an additional $25 for each user. If you’re looking for an inventory management app that’s more in-depth, jumpStock could be for you. However, it’s more costly at $99 per month. But the payoff is the extremely interactive software. It has simple user interfaces, inventory can be customized by department, and any type of inventory management approach can be accommodated (i.e. mobile-based PAR or 2Bin). An iGeek reviewer event went as far as to say it’s like having a human inventory manager on staff, without the man hours. When you are away from the warehouse, or even if you’re in the office, inventory management can be overwhelming. Give yourself peace of mind by having inventory information in the palm of your hand. Current inventory control apps can give you the information you need right at the time you need it. This will give you continuous insights into your warehouse operations and provide you the ability to troubleshoot problems wherever you are, whether you’re home with a sick child or soaking up the sun at the beach. These inventory apps vary in cost and capabilities, but there is something for everyone, even with the smallest budget. What inventory management apps have you tried for your business?